Since Lithuania regained its independence from the Soviet Union in 1991, the country’s second-largest city Kaunas has received a largely bad reputation. As the country was lurching from a planned economy to the free market, it got a reputation as a city notorious for crime. As the focus shifted to Vilnius, Kaunas gained a name as a city with bad roads and poor infrastructure. However, in recent years – especially since the election of mayor Visvaldas Matijošaitis – Lithuania’s second city has started to rebuild its reputation as a city of culture and unique Art Deco architecture, a reputation it enjoyed when it acted as Lithuania’s interwar capital from 1919-1940. The feeling of regeneration in Kaunas is so high, that the city has applied to become the European Capital of Culture in 2022, a title that local cultural journalist Kotryna Lingienė believes would be “stimulating” for the city. In line with Kaunas‘ future ambitions, Lingienė told Deep Baltic that she also been a daily user of the Kaunas architecture guide, which was released in 2014. While the English-language version will come later this year – possibly in summer – she believes the city’s interwar architecture is key in its application to become the future European Capital of Culture. In December 2015, Kaunas became the first Eastern and Central European city to win UNESCO City of Design status. Cities of Design belong to the Creative Cities Network which was founded by UNESCO in 2004. The network is comprised of cities, selected for their contribution in the fields of music, literature, cinema and gastronomy. “I believe it’s because Kaunas has such an unique history of interwar architecture in particular – in the same way that Vilnius has the Vilnius Baroque, which is also unique,” she explained to Deep Baltic. “Kaunas’s Art Deco interwar modern architecture is unique to Kaunas, because it’s not a direct copy of French or German architecture. It’s specific to Kaunas. While warning that it’s easy to get nostalgic over the interwar period as a time of absolute independence for Lithuania, Lingienė lamented the effect of the Soviet and Nazi occupations, beginning in 1940 and 1941 respectively, on Kaunas’ development. “It’s easy to romanticise the interwar period, but during that time, the changes [in Kaunas] were so fast,” she explained. “Buildings were adapted to become embassies or ministries because the city needed more spaces for its new role. “Some of the most historically valuable buildings were built within three months and even by 2016 [standards], that’s quick. 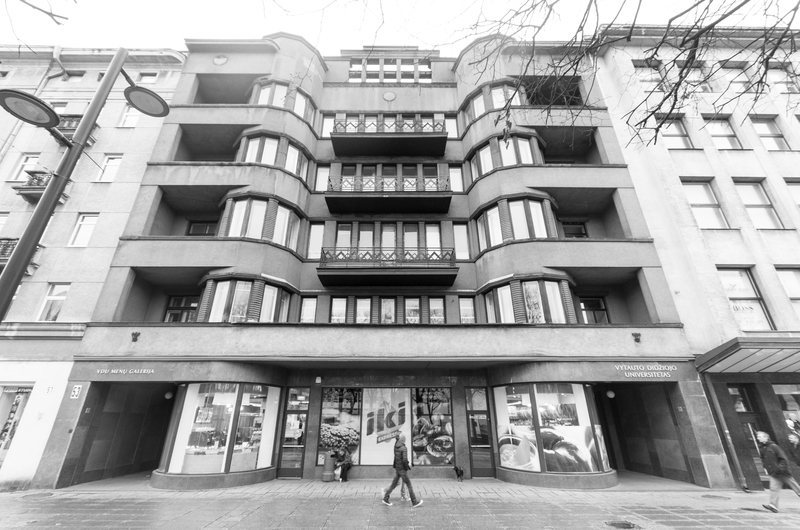 To coincide with Kaunas’s rebirth, the upcoming launch of the English-language version of the Kaunas Architecture Guide and its application to become the 2022 European Capital of Culture, Deep Baltic has chosen seven pieces of the city’s most unique interwar architecture. Built between 1930-1932 and designed by architect Feliksas Vizbaras, who combined modernism with the traditional national “Lithuanian style” of the interwar period, the building still functions as the city’s central post office. Built at a cost of 1.5 million litas – 250,000 of which were spent on decorative purposes – with its four floors, modern elevators and spacious central hall, Kaunas’s central Post Office was a benchmark of contemporary modernism in Lithuania. Inside, the building features an electricity powered clock (installed in 1935) and a black-and-white ceramic floor. The top of the hall sees three paintings depicting the coats of arms from the then-Polish-occupied cities of Vilnius and Grodno, as well as that of the Lithuanian port city Klaipėda. Under these lie 103 contemporary stamps painted by artists Petras and Rimtas Kalpokas. Currently the Kaunas Municipality building, the interwar-period Savings Bank was the result of a three-way design effort by architects Arnas Funkas, Adolfas Lukošaitis and Bronius Elsbergas. Constructed between 1938-1940, the building is made up of three blocks, since it was also intended to accommodate the interwar capital’s commerce department, statistics bureau, as well as other state offices. While its interior lacks many national motifs of the era, in what is now its main debating hall, the building features a glassed ceiling with a black frame that creates an Art Deco print. Now the building of the Territorial Patient Fund, this former retirement home is symbolic of the social progress Kaunas made between 1919 and 1940. This building is one of the many social welfare institutions that Kaunas put in place during its time as the capital. Built between 1937-1939 and designed by architect Karolis Reisonas, it was able to house up to 200 of the city’s elderly. Its level roof, featuring plant pots and benches, was also used as a recreational area for its residents. The building is distinctive thanks to its main facade – the small, uniform windows on the left and right of the building are divided vertically, while the same windows found in the centre are arranged horizontally. This borders of this design feature have been enhanced in recent years by the addition of contrasting dark green paint. Located on Savanorių Prospekt, the Daina movie theatre was a 614-seat cinema. Noticeable by its facade which features four protruding columns and two sizes of rectangular and circular windows, the building was constructed between 1936-1938, a period when Kaunas was thriving culturally as the interwar capital. A collaborative effort of architects Antanas Breimeris and Stasys Kudokas, this modernist design is unusual for two reasons: from above, the cinema takes the shape of an irregular shaped rectangle as a result of the shape of the plot it was built on; secondly, the left-hand wall has a number of window, an unusual feature for a cinema of any period. In its heyday, the facade of the Daina movie theatre was also illuminated by neon tube lights. The former headquarters of the milk processing company, the modernist Pienocentras building, is an example of international award-winning architecture from the interwar period. In 1937, it won a bronze medal and an honorary diploma at the Exposition International des Arts et des Techniques in Paris. It is distinctive due to its arching corner facade, which feature curved windows. When completed in 1934, this five-storey building, designed by architect Vytautas Landsbergis-Žemkalnis, became an example of multi-functionality – in addition to Pienocentras’ administrative offices and shop, the fourth and fifth storeys housed apartments for its employees. The longstanding hair Muralio hair salon also operated in the building from 1920 until the Soviet occupation in 1940. In 1946, a significant proportion of the building was taken over by Kaunas Technological University. In 2016, it is still managed by the institution, but it is planning to sell it. Located in the prestigious Žaliakalnis district, the Church of the Resurrection was designed by Karolis Reisonas and is the most famous church of the interwar period in Lithuania. The term “resurrection” doesn’t only have religious connotations; it also indicates that the church is an important symbol of Lithuania’s national revival. A mixture of conservative and modernist design, this entirely white building stands out thanks to its 63-metre tower. It was also the first church in the world to feature a roof terrace that could be used for services. With the main chamber and roof terrace combined, the church had a capacity of 5,000. While construction began in 1934, it was halted in June 1941 following the Nazi occupation of Lithuania. The Nazi occupiers used it as a warehouse. After the Second World War, when the Soviet Union re-occupied the country, Josef Stalin ordered the tower and chapel to be destroyed in 1952. Until 1988 – the final years of Mikhail Gorbachev’s perestroika – the church operated as a radio factory. It was under Gorbachev that it was returned to the Catholic Church. Reconstruction resumed in 1989 and while the church was consecrated in 2004, it was not completed until 2006. Designed by architect Feliksas Vizbaras and built between 1931-1934, this building housed a number of institutions, publishing houses and editorial offices belonging to the Pažanga publishing company. During the interwar period, the Pažanga company was associated with the Tautininkai, the Nationalist Union of government of President Antanas Smetona. With a number of “national style” external features interpreted in the art deco style, this multidimensional building is striking as a result of its balconies, which are decorated with triangles, zigzags and profiled edges. Inside, the Pažanga building continues the art deco narrative – its cellar had a meeting hall lit by a glass block ceiling, while the roof featured a restaurant with a terrace. In 2016, the building is the art faculty for Kaunas’ Vytautas Magnus University.